…if I do a bad gig and the reviews are bad, well - that’s fine. It’s 11:30PM and the sound of bass emanates from the portal of Las Vegas’ mega club C2K. Tonight is Oakenfold and expectations are high as Las Vegas has become one of the premier clubbing destinations stateside. Clubbing is serious business the city of sin and the casino-based club scene is after the biggest talent money can buy. Tonight’s line surges with eager clubbers pushing their way in merely to catch a glimpse of trance DJ turned rock star, Paul Oakenfold. Legions of strippers guidos, raver types, tourists and ‘sheep’ have congregated. Not necessarily because they know the music, but simply because they know the name. Oakenfold is everywhere. His first major domestic release, Tranceport, is still flying off shelves and the press’ coverage is seemingly ubiquitous. Like it or not, Oakey’s here and he’s ready to take the sound of trance to the masses. However, the masses must be patient tonight as sir trance-a-lot has been detained two hours because of a flight delay. The crowd, showing signs of anxiety due to his tardiness, swells in anticipation of the first tune. He takes the decks, give’s the crowd a once over and begins his assault. They love every minute of the onslaught as he drops the tunes in his crowd pleasing signature style. Driving, melodic and sometimes even pretentious, there is no doubt that Paul’s programming is very often perfect. 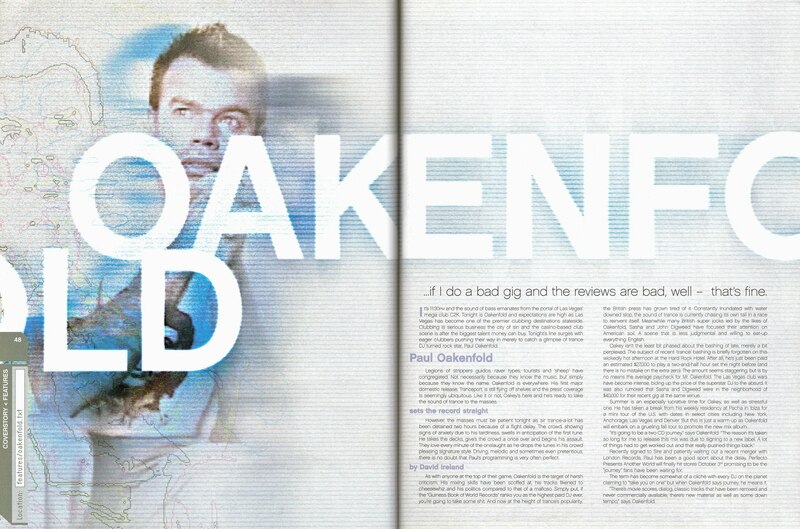 As with anyone at the top of their game, Oakenfold is the target of harsh criticism. His mixing skills have been scoffed at, his tracks likened to cheesewhiz and his politics compared to that of a Mafioso. Simply put, if the “Guiness Book of World Records” ranks you as the highest paid DJ ever, you’re going to take some sh*t. And now at the height of trance’s popularity, the British press has grown tired of it. Constantly inundated with water downed slop, the sound of trance is currently chasing its own tail in a race to reinvent itself. Meanwhile many British super jocks led by the likes of Oakenfold, Sasha and John Digweed have focused their attention on American soil. A scene that is less judgmental and willing to eat-up everything English. Oakey isn’t the least bit phased about the bashing of late, merely a bit perplexed. The subject of recent ‘trance’ bashing is briefly forgotten on this wickedly hot afternoon at the Hard Rock Hotel. After all, he’s just been paid an estimated $27,000 to play a two-and-half hour set the night before (and there is no mistake on that extra zero). The amount seems staggering, but is by no means the average paycheck for Mr. Oakenfold. The Las Vegas club wars have become intense, biding up the price of the superstar DJ to the absurd. It was also rumored that Sasha and Digweed were in the neighborhood of $40,000 for their recent gig at the same venue. Summer is an especially lucrative time for Oakey, as well as stressful one. He has taken a break from his weekly residency at Pacha in Ibiza for a mini tour of the U.S. with dates in select cities including New York, Anchorage, Las Vegas and Denver. But this is just a warm-up as Oakenfold will embark on a grueling fall tour to promote the new mix album. Recently signed to Sire and patiently waiting out a recent merger with London Records, Paul has been a good sport about the delay. Perfecto Presents Another World will finally hit stores October 3rd promising to be the “journey” fans have been waiting for. The term has become somewhat of a cliché with every DJ on the planet claiming to “take you on one” but when Oakenfold says journey, he means it. “There’s movie scores, dialog, classic tracks that have been remixed and never commercially available, there’s new material as well as some down tempo,” says Oakenfold. 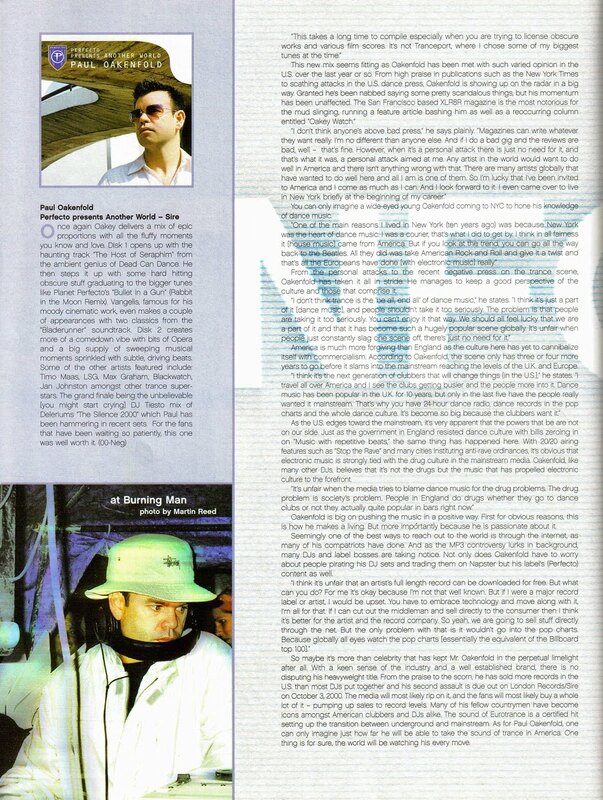 You can only imagine a wide-eyed young Oakenfold coming to NYC to hone his knowledge of dance music. From the personal attacks to the recent negative press on the trance scene, Oakenfold has taken it all in stride. He manages to keep a good perspective of the culture and those that comprise it. America is much more forgiving than England as the culture here has yet to cannibalize itself with commercialism. According to Oakenfold, the scene only has three of four more years to go before it slams into the mainstream reaching the levels of the U.K. and Europe. As the U.S. edges toward the mainstream, it’s very apparent that the powers that be are not on our side. Just as the government in England resisted dance culture with bills zeroing in on “Music with repetitive beats,” the same thing has happened here. With 20/20 airing features such as “Stop the Rave” and many cities instituting anti-rave ordinances, it’s obvious that electronic music is strongly tied with the drug culture in the mainstream media. Oakenfold, like many other DJs, believes that it’s not the drugs but the music that has propelled electronic culture to the forefront. Oakenfold is big on pushing the music in a positive way. First for obvious reasons, this is how he makes a living. But more importantly because he is passionate about it. Seemingly one of the best ways to reach out to the world is through the internet, as many of his compatriots have done. And as the MP3 controversy lurks in the background, many DJs and label bosses are taking notice. Not only does Oakenfold have to worry about people pirating his DJ sets and trading them on Napster but his label’s (Perfecto) content as well. So maybe it’s more than celebrity that has kept Mr. Oakenfold in the perpetual limelight after all. With a keen sense of the industry and a well established brand, there is no disputing his heavyweight title. From the praise to the scorn, he has sold more records in the U.S. than most DJs put together and his second assault is due out on London Records/Sire on October 3, 2000. The media will most likely rip on it, and the fans will most likely buy a whole lot off it - pumping after all. With a keen sense of the industry and a well established brand, there is no disputing his heavyweight title. From the praise to the scorn, he has sold more records in the U.S. than most DJs put together and his second assault is due out on London Records/Sire on October 3, 2000. The media will most likely rip on it, and the fans will most likely buy a whole lot off it – pumping up sales to record levels. Many of his fellow countrymen have become icons amongst American clubbers and DJs alike. The sound of Eurotrance is a certified hit setting up the transition between underground and mainstream. 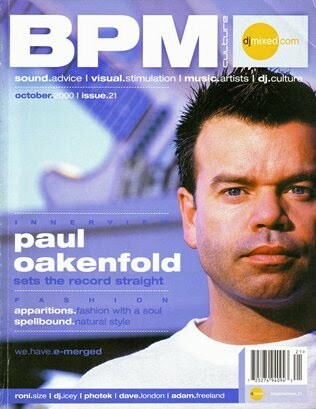 As for Paul Oakenfold, one can only imagine just how far he will be able to take the sound of trance in America. One thing is for sure, the world will be watching his every move.